Matt Kuchar will line up at the World Cup of Golf in Melbourne in November. TEAM America's Ryder Cup defeat in September only increased Matt Kuchar's desire to get to the World Cup of Golf next month, take down the Aussie favourites and restore some national pride. 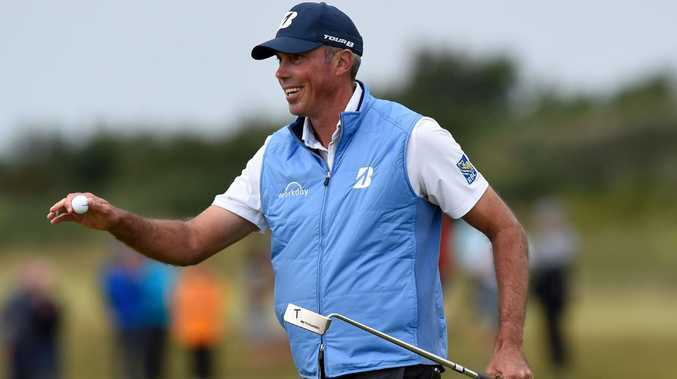 A former Ryder Cup and Presidents Cup player, as well as an Olympic gold medallist, Kuchar values playing for his country so highly that he lobbied to partner countryman Kyle Stanley at the $9.8 million event. Having won the World Cup in 2011 with Gary Woodland, and running second behind Aussie duo Jason Day and Adam Scott in Melbourne in 2013, Kuchar, the world No.38, said the trophy takes pride of place in his home. He sought out Stanley, after several top-ranked Americans passed on the opportunity to play in Melbourne because of the clash with the Thanksgiving holidays, and Jordan Spieth's wedding. Kuchar said it was a "stretch" to think his World Cup appearance could help him return next year with Tiger Woods for the Presidents Cup, and was just desperate to win it again when the event tees off at Metropolitan in Melbourne. "This is representing the United States … just playing for your country is a big deal," Kuchar said from Las Vegas where he's competing this week. "It's something every time I get a chance to do it, I am all on board. I think I started when I was in college playing the Palmer Cup, Walker Cup, they're such cool things to be representing your country, and then all the way to Ryder Cup, Presidents Cup, World Cups, awesome events. "There's a huge amount of pride there and you certainly don't want to let your country down. You want to perform to your best and make your country proud. "That trophy I won with Gary Woodland sits in a prominent place in the house and I'm awfully proud of it. To have a chance to go back was something I really wanted to do. This is a chance to be one of two people to represent your country." Kuchar will also play the Australian Open in Sydney before the World Cup to better acclimatise to conditions local World Cup hopes, Marc Leishman and Cameron Smith, know how to play in. Matt Kuchar lines up a putt during the Open Championship at Royal Birkdale. The genial American, a seven-time winner on the US PGA Tour, was at first confused by Leishman's initial appraisal of the Metropolitan layout but he knows now he's in for a treat. "It's funny, on the information sheet for the World Cup was a picture of Metropolitan Golf Club with a quote from Marc Leishman, 'Best conditioned golf course in the world'," Kuchar said. "I said, 'If ever somebody asked me about a golf course and I say it's in really good shape, that means I don't like it very much'. "It's an interesting response and I told some people that, and some people that I told from Melbourne, from the area, said, 'No, no, no, you don't understand, it is the best conditioned golf course and it's really good as well'. "But I know that's not what the point was because everybody I talk to says Metropolitan is just that, it is going to be one of the best conditioned courses you've ever played, plus a great golf course as well. "And yeah, they (Leishman and Smith) will certainly be a tough team."